We all have that one school friend– the strange kid, the class freak, the guy whose antics amused and entertained, maybe even alarmed us. The one who sticks in our heads even with the passing of the years. That classmate is invariably left behind when we graduate into the adult world, vanishing into memory, filed away with our old yearbooks and other teenage mementos. But every now and then, we wonder, whatever happened to that friend? For one man who grew up in a small town in Ohio, that question was answered by every media outlet in the world on July 22, 1991. For the friend in question was... Jeffrey Dahmer! 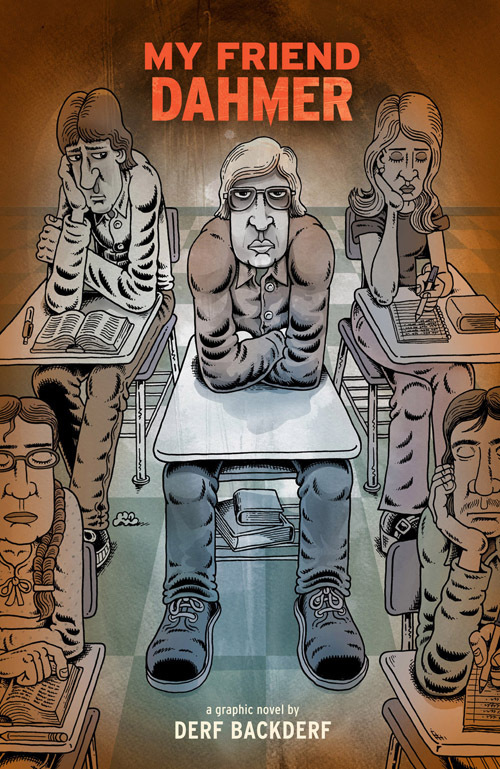 MY FRIEND DAHMER is the haunting, new graphic novel by Derf Backderf, an award-winning cartoonist and comix creator. In these pages, Backderf tries to make sense of the iconic monster who he shared the same school hallways, cafeterias, libraries, and compulsive car rides. What emerges is a surprisingly sympathetic portrait of a disturbed young man struggling helplessly against the ghastly urges bubbling up from the deep recesses of his psyche. The Dahmer recounted here, universally regarded as an inhuman monster by the rest of the world, is a lonely oddball who, in reality, is all too human. A shy kid who is sucked inexorably into madness while the adults in his life fail to notice. We all know what Dahmer did, but in MY FRIEND DAHMER, Backderf provides, from his unique vantage point, profound (and at times, even strangely comic) insight into how, and more importantly, why Jeffrey Dahmer transformed from a high school nerd into a depraved fiend as notorious as Jack the Ripper. In MY FRIEND DAHMER, Derf comes as close as anyone yet has to explaining the seemingly unexplainable phenomenon of one Jeffrey Dahmer, Revere High School, Class of 1978. The graphic novel that's taken the book world by storm!